To tow means ‘to pull or haul with a chain, rope, or other device’ and the noun tow refers to the act of towing, to the thing being towed (especially when it is a boat or boats), and also to the vehicle that tows something. 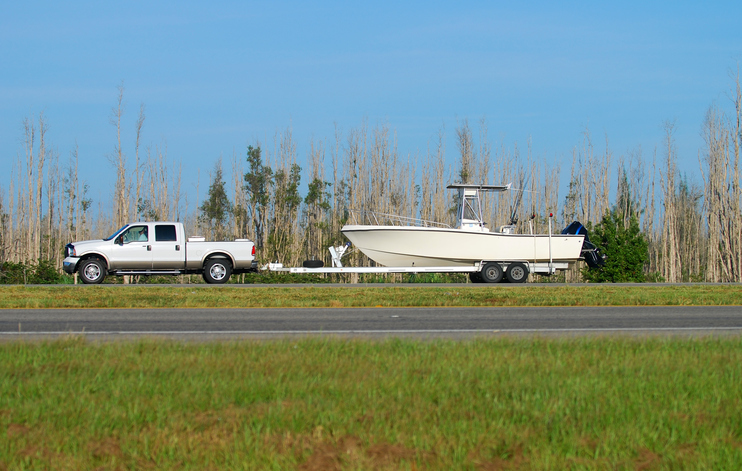 More broadly, a rope, chain, or metal bar used for towing can also be called a tow. Unrelatedly, tow is the fiber of flax, hemp, or jute prepared for spinning, or any synthetic filaments prepared for spinning. As an adjective, tow refers to anything made of tow. It was a long tow and we weren't sure if our old car was up to the task. The tug had a tow of twenty boats. The tow was pulling several boats behind it. Patricia hitched the trailer onto the tow. The machines in the factory were busy spinning the tow into cloth. The sacks were made of tow cloth. Related to the flax meaning, tow-haired or tow-headed is an adjective that means someone has very blond hair (flaxen is also used as an adjective for hair with the meaning of very blond or fair). Tow, the verb meaning ‘to pull with a rope or chain,’ dates back to before the year 1000. The Old English togian (to drag or pull), which became the Middle English towen, came from the Proto-Germanic tugojanan and the Proto-Indo-European deuk- (to lead). It is related to the Old English teon (to draw or pull), the Old Frisian togia (to pull), the Old Norse toga, the Old High German zogon and the German ziehen (to draw, pull or drag), as well as the English verb tug and, more distantly, the Latin ducere (to lead). The noun comes from the verb and, meaning ‘the rope used for towing,’ dates back to around the year 1600. The meanings ‘the act of towing’ and ‘the thing being towed’ both appeared in the early 17th century, and expanded to include ‘the vehicle used for towing’ in the mid-18th century. The unrelated noun, ‘the fibers of flax, hemp or other filaments’ for spinning, dates back to the late 14th or early 15th century. It appeared in Scots dialect, and probably comes from the Old English prefix tow-, meaning ‘spinning,’ and found in compounds like towlic (fit for spinning) or tow-hus (spinning room). It can be traced back to the Proto-Germanic root taw (to manufacture), and is related to the Gothic taujan (to do, make) and the Middle Dutch touwen (to knit or weave).